The asbestos professionals at EMS (Environmental Management Solutions) received their first Alpha Tracker training yesterday and are looking forward to the benefits their new asbestos system will bring their business and their valued clients. 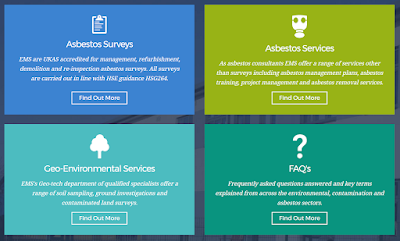 EMS is an impressive asbestos consultancy business developing their client base and range of professional services since their inception in 2003. Based in Herefordshire but with satellite offices around the country, EMS offer a full range of asbestos and environmental services to their clients. Kim and Jack took a few photos during the surveyor training; here are the surveyors getting to grips with Tracker Mobile, our handheld asbestos site data capture app for Android and Apple devices. Have you updated your asbestos software Alpha Tracker to the latest version, Release 24? If so, please download the patch we have just made available which fixes a couple of bugs and adds a few new features. In particular, if you use Internet Explorer rather than Chrome or Edge as your web browser, this version will work much better for you. Thanks to customers for letting us know about problems they found. We do our best to test every situation but there is always a chance that something will slip through. We had an ISO9001 Quality Assessor on site with us all day yesterday to check our processes and performance. I'm delighted to announce that thanks to the hard work of the Start Software team and our Quality Manager Kim in particular, we passed the assessment with flying colours. Asbestos software Alpha Tracker Release 24 is now available - finally! This has proven to be our biggest update ever delivered with a wide range of new features, performance improvements and bug fixes. More than 130 changes altogether have been delivered in this release. new settings to help you to simplify screens for new users. Kim has posted the release notes for you to download, print and keep with your quality manual or in your office procedures folder. Do let us know what you think. We are planning Release 25 now (for Summer 2017) so do get your ideas over to us for improvements we can make. We've made the news today - but we'd all certainly rather we hadn't! After the office was evacuated we had the support desk up and running in 30 minutes which isn't bad at all but we do apologise to our support clients if you had trouble reaching us this afternoon. There has been a substation fire near our Telford support office and so we have had to evacuate the building. We are expecting to be back in the office tomorrow. Asbestos Building Surveys (#AskABS) are the latest specialist asbestos consultancy to incorporate asbestos software Alpha Tracker into their operations. Based in East Kilbride, ABS is a UKAS accredited asbestos surveying practice (Inspection Body No. 0298), which provides surveying, sampling and re-inspection services across the public and private sectors, from small residential properties to commercial units and industrial power stations. Following on from my blog post about how to view asbestos software Alpha Tracker's performance (see http://robinbennett.blogspot.co.uk/2017/03/how-can-i-check-my-alpha-tracker-system.html) we had feedback from clients that this wasn't as easy as it should be. So we've made it easier! 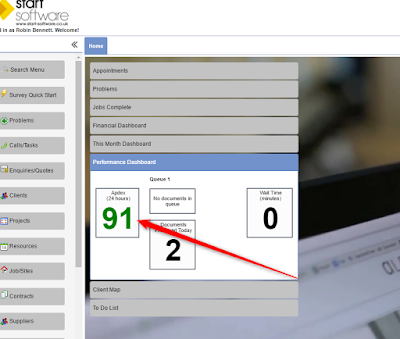 The Apdex score is a software industry standard method for showing how well a computer system is performing. 100 is the maximum score and anything over 75 is deemed to be "good" and so will show as green. If you have any more feedback or changes you would like to see in Alpha Tracker, do let us know. How can I check my Alpha Tracker system performance? Easy! Log in to Alpha Tracker as a Superuser and select menu option Setup|System|Access Log. This screen shows you every transaction your asbestos surveyors or admin staff have completed in the system together with the time each one took (in seconds). At the bottom of the screen, you'll see an overall "Apdex" score. If this is showing > 0.75 then your system is performing well. Below that it's time to get in touch with our support desk for advice. We reported yesterday that some users were experiencing syncing issues using Tracker Mobile after their handsets had auto-updated to Android 7. We're pleased to announce that this issue has been investigated and a fix is now available which fully resolves the problem. Contact our support desk for the update file and instructions. Please be advised that some users are reporting issues syncing their Tracker Mobile data immediately after their smartphones or tablets have updated to Android 7. We are aware of the issue and the developers are isolating the issue in order to provide a solution. Please leave your data on your handsets for now and contact our support desk on 0333 301 1010 (UK) for more information. Our support team had a good month in February resolving more than 95% of urgent calls within the timescales set by our customers. Nearly 500 calls were taken and resolved altogether - busy but not a record!